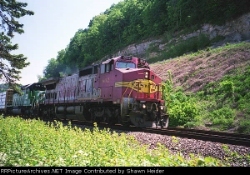 Welcome to Shawn Heider's Railroad Picture Archives! Welcome to the RRPictureArchives.NET contributor site of Shawn Heider. Welcome to my RRPictureArchives.NET page. This site contains a variety of photos. Mostly of BNSF along the Mississippi River between East Dubuque, IL and LaCrosse, WI; WSOR around Janeville, WI; and DME in south central MN.